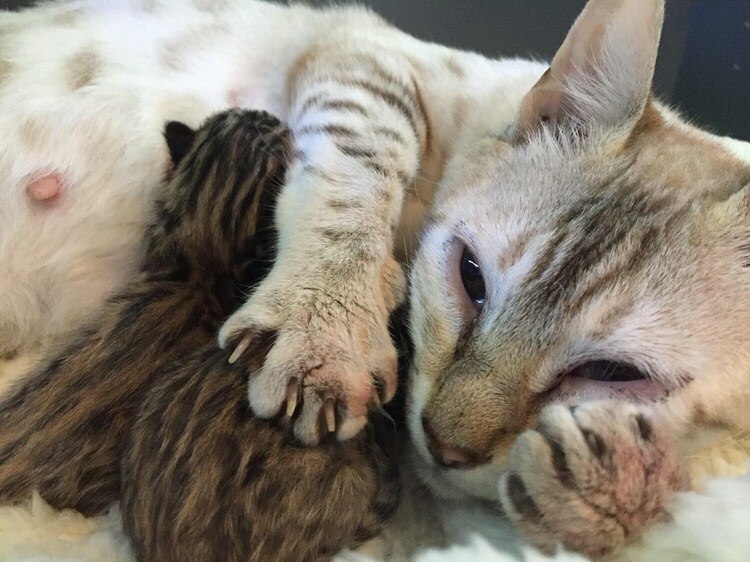 Living strictly to give birth repeatedly at a backyard breeder, Felicity the White Bengal cat never got to know her kitten litters. Each litter would be taken away one after another and sold. This poor cat never was given love or affection and to say that her life was rough would be an understatement. When Felicity was rescued by Tiny Kittens, a rescue organization in Langley BC, she was in extremely poor health and pregnant yet again. When Tiny Kittens checked her out, Felicity was plagued with anxiety, fleas, ear mites, tapeworms, an upper respiratory infection, and a uterine infection. Being so sick was putting her babies in jeopardy. 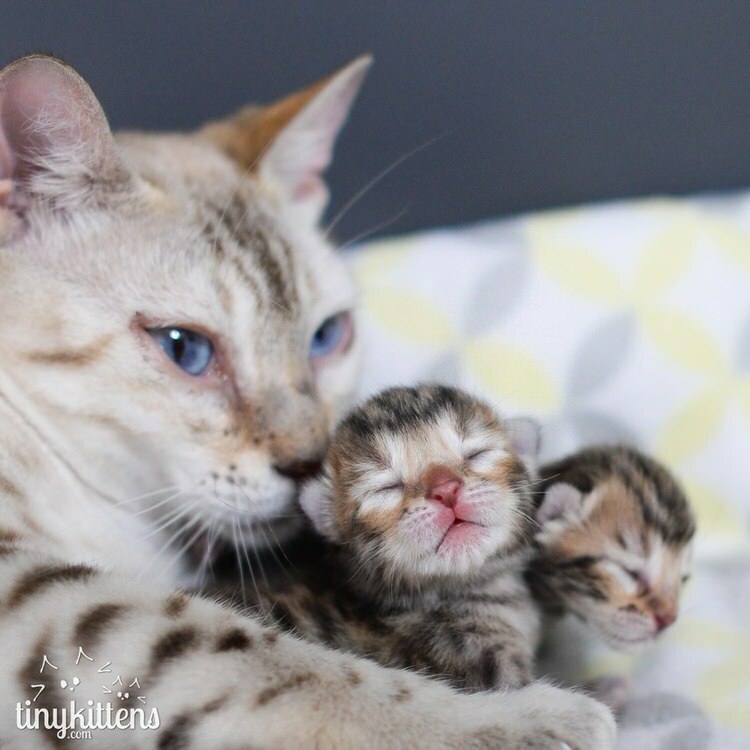 During the next while in the hands of Tiny Kittens, Felicity showed signs of miscarriages, but eventually, she gave birth to two miracle babies. 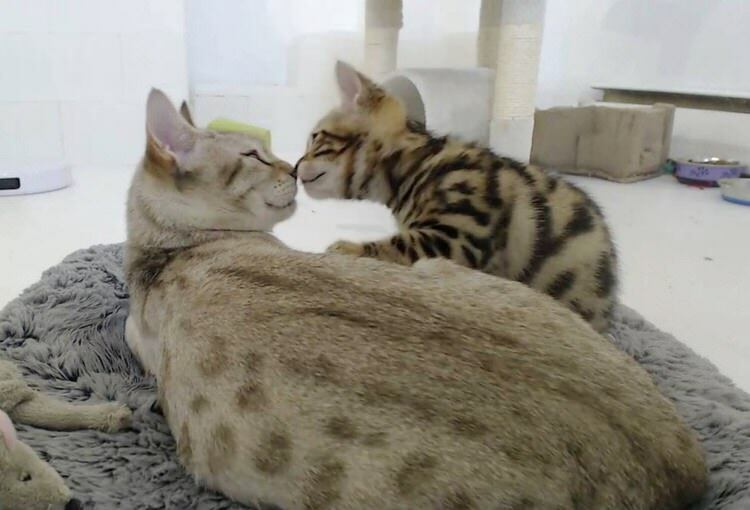 With her poor health, many expected her not to be attentive to her newborn babies, but Felicity was the exemplary mama cat. Staying close to her babies, nursing them, and showing them love. 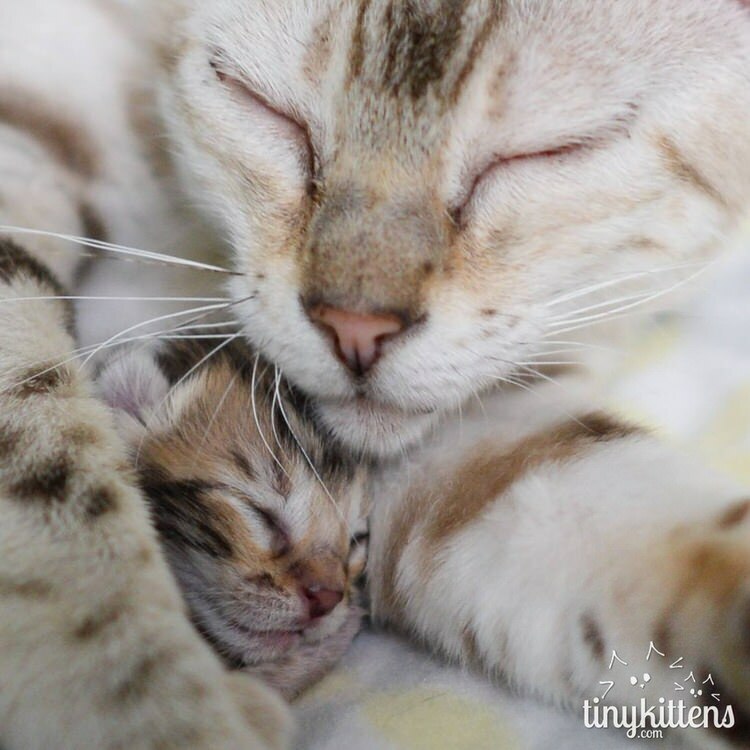 Now healthy because of the efforts of Tiny Kitten, Felicity loves snuggling with her babies and is quite enjoying human affection as well. 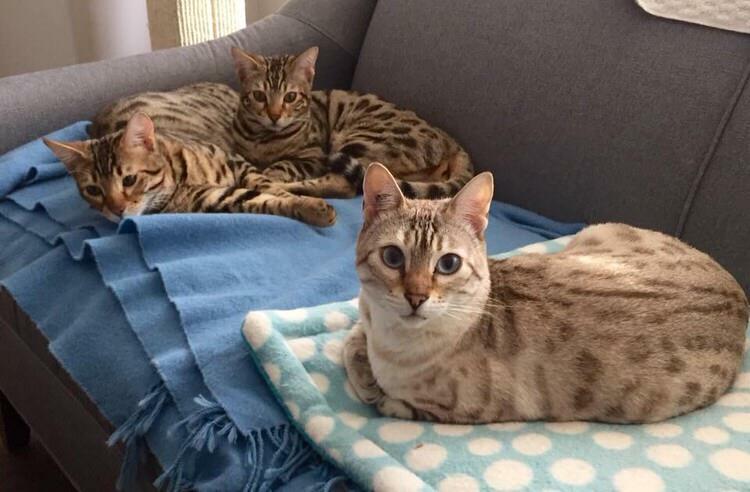 A woman fell head over heels in love with all three of these beautiful cats and adopted them all. 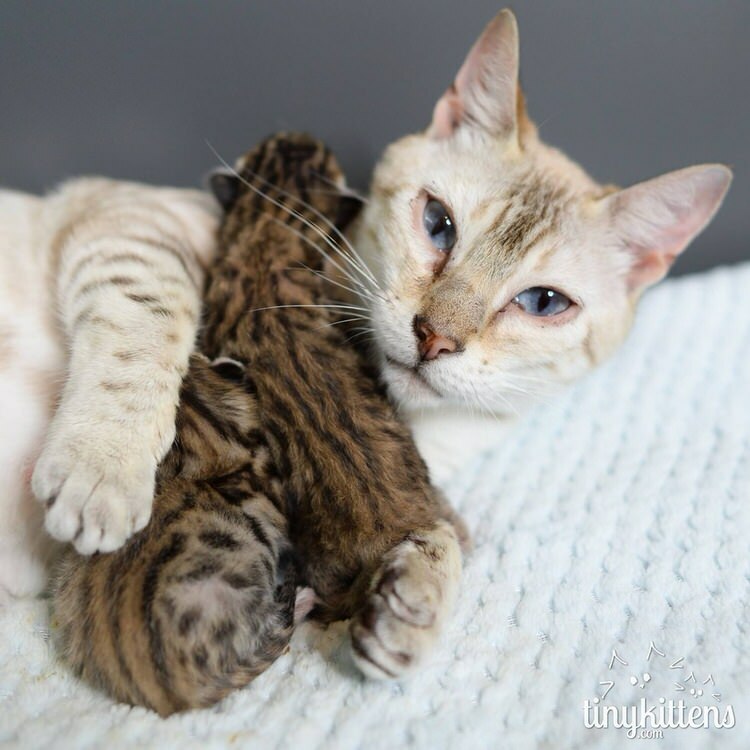 Now Felicity can finally enjoy being a mom, and the three cats have a forever home filled with love.